Sophomore Kennedy Garrett pushes past Mars Hill’s Aerial Ellis at Greenwood Field last Wednesday. 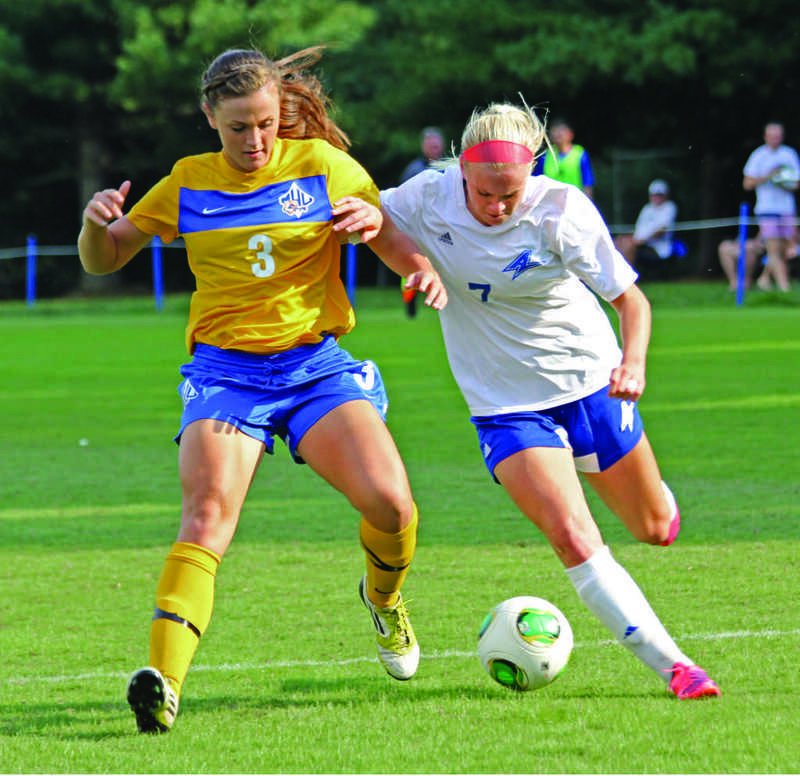 UNC Asheville women’s soccer team defeated Mars Hill in overtime this past Wednesday. Both the Bulldogs and Mountain Lions had trouble finding the back of the net during regulation. However, sophomore midfielder Shenny Lenhart scored the winning goal less than a minute into overtime. It was Lenhart’s second goal of the season. According to Lenhart, it was the support of her team on the field and coaching staff that made it happen. Kennedy Garrett, a sophomore forward for UNCA, agrees that a win doesn’t just come from the players on the field. The Bulldogs had just come off a loss at Chattanooga three days prior, which brought their record to 3-3-0. The loss had been described as a fluke by Lenhart. During the first half, the Bulldogs’ pace was slow but UNCA pulled together as the time clock elapsed. With only five minutes left in regulation, the score was still tied 0-0. A 30-minute rain delay gave the Bulldogs’ a chance to regroup. Coach Demko and Assistant Coach Joey Sasvari provided the integral support the women’s team needed to find their footing late in the game. As the Bulldogs gain confidence, some players switch positions on the field and utilize their versatility. Both Garrett and Lenhart can play nearly anywhere on the field, and the chemistry they create with their teammates raises the Bulldogs’ level of play.